Our variable speed pumps help your system to improve the energy saving. The pump with an unique suction structure is installable up to 2m above the water level. PF series are sealless pumps with disk magnetic coupling and suitable for limited installation spaces. PS series are sealless pumps with sleeve magnetic coupling, are suitable for high flow up to 50L/min. We respond to your inquiries such as design, assembly, installaton and maintenance! Variable sensors to enhance your system performance! In 2005 we joined a project held by NEDO (New Energy and Industrial Technology Development Organization) to develop the water pump for household fuel cell systems. Through the process of development with fuel cell manufactures, we found that they were still seeking some solutions to monitor the quality of water. Our experiences and knowledge in water treatment met their needs, therefore we came to develop the sensors and the water treatment filters. Since 2009 in which a household fuel cell sysytem was launched in Japan, our products have been used for fuel cell systems of various manufacturers. Company Name : OGIHARA MFG. Co., Ltd.
Products : Water pumps, sensors, FC accessories, water treatment systems and moldings. OGHARA MFG. CO.,LTD. is established as a motor manufacturer. OGIHARA starts the water treatment business. OGIHARA starts the water pump business for water boiler market. SELF-SUCTION water pumps (SF90/SM90) dominate the marktet in Japan. Accumulated pump production achieves 10,000,000. OGIHARA splits off its dies division into an independent subsidiary named OGF. OGF starts the molding business for its own products and for unaffiliated customers. 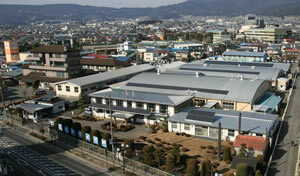 OGIHARA absorbs TOKIWA ELECTRIC as the main manufacturing base. OGIHARA is certified according to ISO-14001. OGIHARA splits off its water treatment division into an independent subsidiary named HOSTEC. Accumulated pump production achieves 20,000,000. We are looking for suppliers can cooperate with us for better quality of our products.